Peter Lamprey writes that he has very little free time as most of the time is spent flying. Machine Room. Waterlow and Sons. Ltd.
Don’t think I am getting niggly but, the last time I heard from you was around about last Xmas – or near enough. Now don’t think for one moment I am binding but., [sic] if I don’t get something soon I shall have to presume you are missing, hoped etc. amount of pointing out that this idea was never contemplated when joining, will make them alter their ways. I have spent so much time off the deck lately that I have to think twice before I go to the bog as to whether I ought to take my ‘chute. the weather will break or I will. News otherwise from here is nil or taboo so what in hell I am to write about I dont [sic] know. You don’t want to hear about my life in the mess. You know they sell that wicked stuff called beer in there so you can guess how I spend what evenings I manage to scrounge off. Time off has been at a minimum lately so there has been no time to write to any of the other herbs. In any case I don’t think a senior N.C.O. ought to be too pally with the erks. You can mention my views if. [sic] you write to them at any time. I take it that all are well and happy at P.R. just easing the old war along nicely and not letting it get out of hand? If Uncle Dave is still running off the rails and getting into his old RIP habits again detail Rusty to speak sharply to him. Remember me to the rest of the works wonders. Don’t be to [sic] sudden in replying, I have a horror of the unexpected. 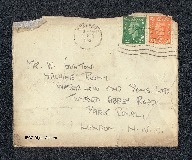 Peter Lamprey, “Letter from Peter Lamprey to W Gunton,” IBCC Digital Archive, accessed April 20, 2019, https://ibccdigitalarchive.lincoln.ac.uk/omeka/collections/document/6609.